Wellcome Trust-funded scientists at UCL have shown that working as a piano tuner may lead to changes in the structure of the memory and navigation areas of the brain. The study, published today in the Journal of Neuroscience, shows that these structural differences correlate with the number of years of experience a piano tuner has accumulated. 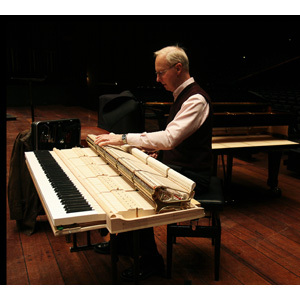 Piano tuning involves listening to the sound of two notes played simultaneously (a two-note chord) and 'navigating' between sequences of chords in which one note is already tuned and the other has to be adjusted. Interaction between the sounds produced by the two notes produces a wobbling sound (known as a 'beat'). Tuners detect the frequency of this fluctuation (the 'beat rate') and adjust it so that the two notes are in tune. Since different combinations of notes in a chord produce different frequencies, tuners use these beat rates as a form of acoustic 'signpost' in the virtual 'pitch space' of a piano to help them tune subsequent notes in a systematic manner. Researchers at the Wellcome Trust Centre for Neuroimaging at UCL and Newcastle University used magnetic resonance imaging (MRI) to examine how the brain structures of 19 professional piano tuners differed from those of 19 controls. The tuners, from across the UK, all tune pianos by ear, without the use of any electronic instruments. Sundeep Teki from UCL, joint first author of the study, explains: "Piano tuning is a unique profession and this motivated us to investigate physical changes in the brain of tuners that may develop over several years of repeated acoustic practice. We already know that musical training can correlate with structural changes, but our group of professionals offered a rare opportunity to examine the ability of the brain to adapt over time to a very specialised form of listening." We already know that musical training can correlate with structural changes, but our group of professionals offered a rare opportunity to examine the ability of the brain to adapt over time to a very specialised form of listening. The researchers found highly specific changes in both the grey matter (the nerve cells where information processing takes place) and the white matter (the connections between cells) within a particular part of the brain: the hippocampus. These changes significantly correlated with the number of years that tuners have been performing the task. The changes were not related to age or to musical expertise. In fact, musical expertise and perfect pitch are not necessary for the basic skill practised by tuners. "Perhaps surprisingly, the changes related to tuning experience that we found were not in the auditory part of the brain. In fact, they actually occurred in the hippocampus, a part of the brain traditionally associated with memory and navigation,"adds Dr Sukhbinder Kumar from Newcastle University, joint first author. Similar changes related to navigational expertise have previously been demonstrated in a different part of the hippocampus in a study of taxi drivers by Professor Eleanor Maguire, also based at Wellcome Trust Centre for Neuroimaging at UCL. Professor Tim Griffiths from Newcastle University, who led the current study, says: "There has been little work on the role of the hippocampus in auditory analysis. Our study is consistent with a form of navigation in pitch space as opposed to the more accepted role in spatial navigation." Paper reference: Teki S, Kumar S et al. Navigating the auditory scene: an expert role for the hippocampus. J Neuroscience 29 August 2012.